Read the article about the event below to give you an idea of why this is one of best parties of the year. Call Don Lawrence at 716-445-2205 for tickets. 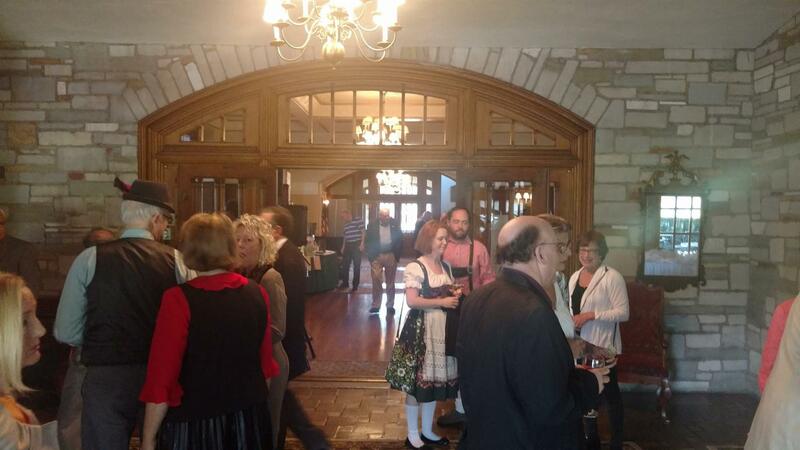 Last night the Rotary Club of Amherst held another successful Sproktoberfest (Spring-Oktoberfest) fundraiser at the Park Country Club. With over 200 tickets sold or purchased with Sponsorship packages the event will surely be a terrific success once the final tallies come in. 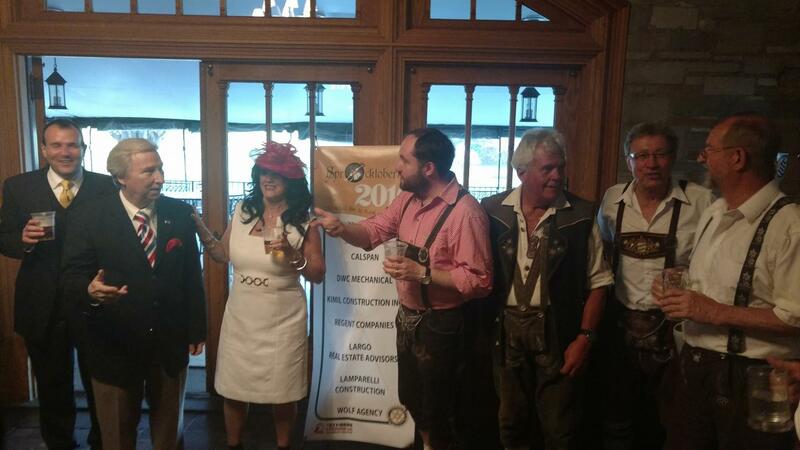 Sproktoberfest has been a Rotary Club of Amherst tradition for over 25 years. This annual celebration of Spring in a German fashion has always been one of the highlights of the Club Calendar. This may prove to be the most successful Sproktoberfest of all time. 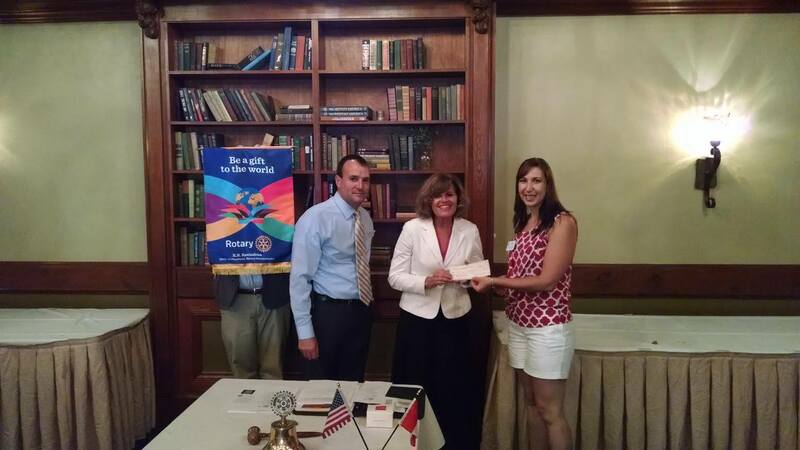 Previous events have funded a number of great local and international charities including our Club's support of education programs in Tanzania and our joint project with the Williamsville Club for a roof on the "Rotary Pavilion" at the Buffalo Niagara Heritage Village. This year the Rotary Club of Amherst Foundation will fund a number of projects including Cornerstone Manor at the Buffalo City Mission d the Boys and Girls Club of Buffalo. 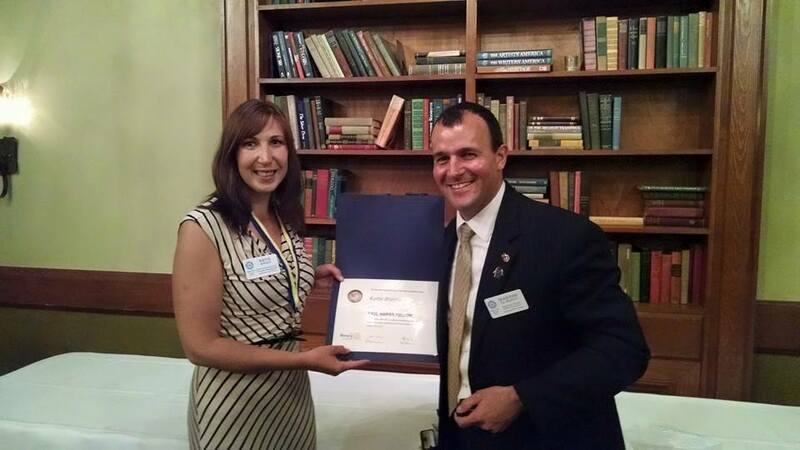 Follow the Rotary Club of Amherst on facebook to stay up to date on all our Events and community involvement. An annual Rotary Club of Amherst tradition "Sproktoberfest" (a Spring Oktoberfest) join us at Park Country Club on Wednesday May 18th from 6-9PM tickets are $45 presale or $50 at the door. Proceeds to benefit Boys & Girls Clubs of Buffalo, Buffalo City Mission Cornerstone Manor, and the Amherst Rotary Foundation. Email Club President Isadore idemarco@echa.org or find a Member for presale tickets! 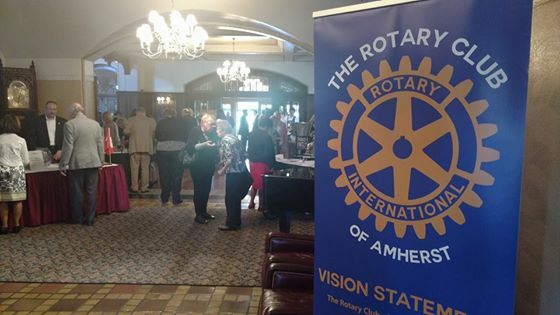 Don't forget to follow Amherst Rotary on Facebook for all the Club Updates. The Rotary Club of Amherst is a premier Service Club in the community involved in worthwhile local and international projects. We are committed to the Rotary motto “Service Above Self,” providing compassionate service to others, while enjoying fellowship and personal fulfillment. It's officially still summer and the weather seems to still be beautiful in Buffalo, but the Rotary Club of Amherst is gearing up for our new Fall Tradition, the Harvest Moon Dinner Dance. After our first successful Dinner Dance in 2014 we are pleased to see the event return for 2015 as our new Fall Fundraiser. Hosted by the Rotary Club of Amherst and the Rotary Club of Amherst Foundation, the event will again return to the Buffalo Yacht Club in downtown Buffalo on the beautiful Niagara River. Live music will again be presented by The Flying Blind and tickets will be available from Club Members for $75/each including buffet dinner with wine and a cash bar. This year the proceeds will benefit Gerard Place and the Cervical Cancer Screening Project in Belize along with the Rotary Club of Amherst Foundation. (See below for flyer). Contact Club President Isadore DeMarco idemarco@echa.org for more information. 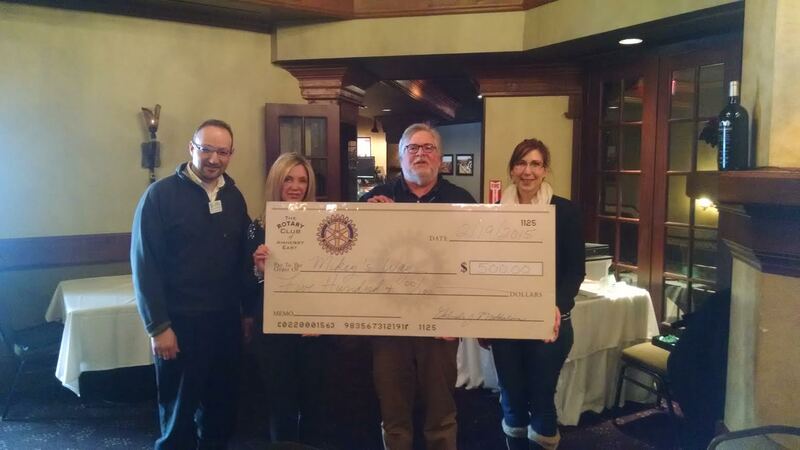 The Rotary Club of Amherst is also very happy to have presented checks from our recent Sproktoberfest 2015 Fundraiser (our spring Oktoberfest will be held again at Park Country Club in May of 2016 stay tuned for details). The recipients of the major proceeds of $3000 each were The Salvation Army of Buffalo and the Family Justice Center of Erie County, Amherst Locaiton. We were proud to present checks to Salvation Army Major Tom Applin and Family Justice Center Executive Director Mary Travers Murphy at a recent lunch meeting. Our annual Entertainment Book drive (please contact us to purchase your 2016 books) raised money for tablet computers for a school in Tanzania. The tablets we selected were android powered full featured tablets manufactured by Bak USA right here in Buffalo, NY. 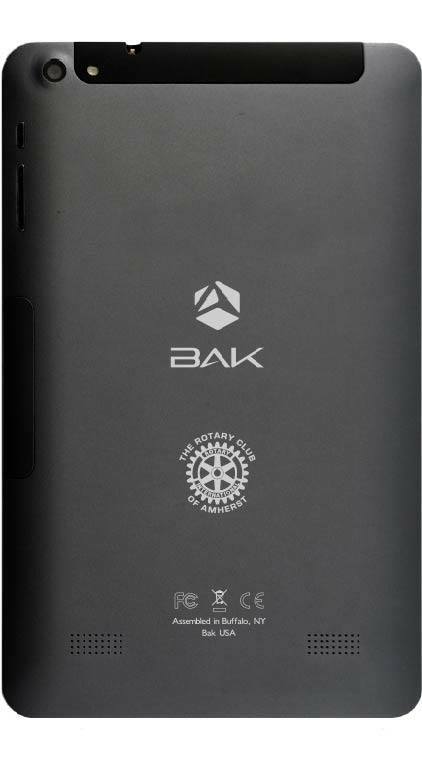 Bak USA was gracious enough to customize the tablets with the Rotary Club of Amherst logo! 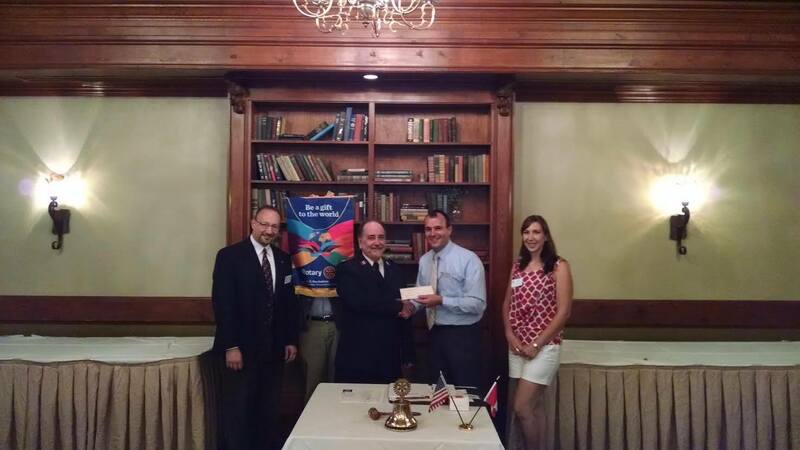 I n August we welcomed District Governor Kevin Crosby to our Club for a visit and were proud to present him with a check on behalf of our Members contribution to the Every Rotarian Every Year (EREY) program of the Rotary Internation Foundation. 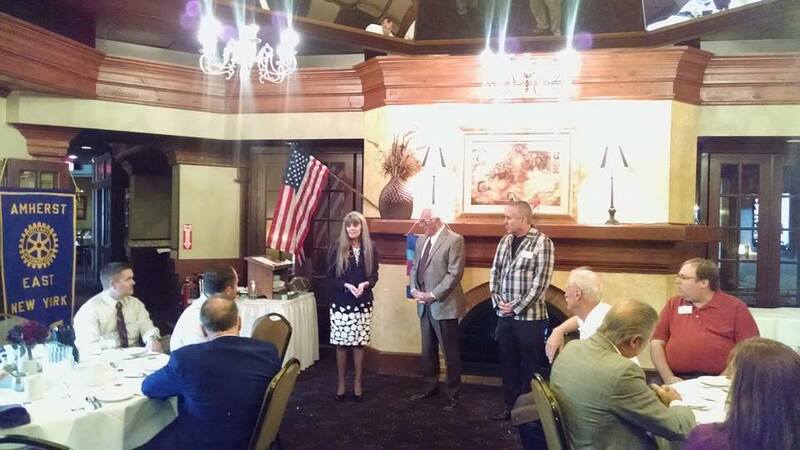 Additionally the Rotary Club of Amherst has continued to support the Rotary International Foundation and as such we were able to present three Paul Harris Fellow awards this year. Two were presented to members: one to Immediate Past President Dr. Katie Biggie (now President of the Roundabout Rotary Buffalo Niagara) and another to Past President Cindy Munschauer. The third was presented to a community member, Russell Salvatore for his continued support of the Buffalo community. For the most up to date information on our Club please follow us on Facebook. The Rotary Club of Amherst is pleased to have presented a check to the Mikey's Way Foundation for the second year in a row. Pictured left to right are Past President (2013-2014) Gabe Maddelana, Club Secretary Carolyn Yurtchuk, Mikey's Way Director Les Friedman and Club President Dr. Katie Biggie. "It is the goal of the Mikey’s Way Foundation to be able to connect every hospitalized child with their friends, family and school, enabling them to cope with the separation during long-term treatment for cancer and other life threatening illnesses. We ensure this connection through the use of the Internet (Skype) and our ability to supply every child with a laptop computer, netbook or similar electronic device. In creating this connection we are in turn presenting the child with a form of diversion. This diversion helps create the Mind-Body Connection and a way for them to escape…Mikey’s Way." 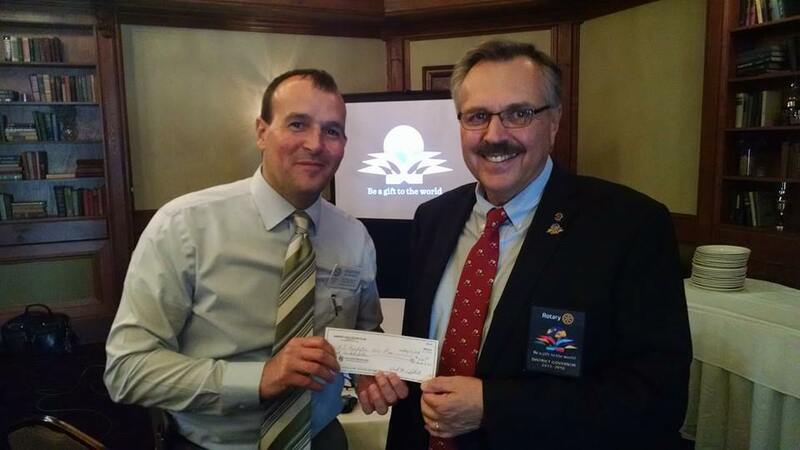 2015 Another great Rotary year! 2015 is starting off to be a great year with the Rotary Club of Amherst moving to a terrific new venue Rizotto Ristorante on Maple Road. Additionally our Club President Dr. Katie Biggie recently returned from a trip to Tanzania as part of a University at Buffalo program. 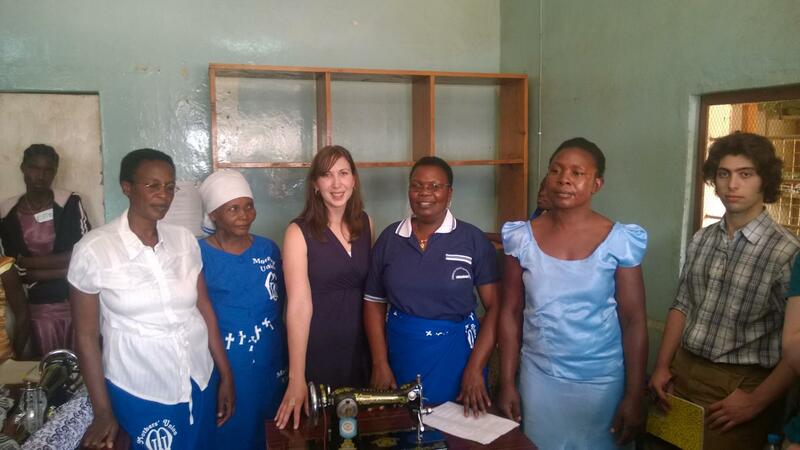 While she was there she was able to oversee our Club's donation of sewing machines and desks to a trade school. This project was made possible by our Club's fundraising efforts and a District 7090 matching grant. 2014 also closed fantastically, though bittersweet. With a great tradition of hosting a Christmas party in early December for the patients of the Erie County Medical Center skilled nursing facility which has grown over the past two years with the County's building of the beautiful new Terrace View complex. Each year Rotarians, friends and family join the patients there to sing carols, give presents, eat pizza, and enjoy a visit from a special Santa. The bittersweet part was in late December we had a fantastic farewell party to the Westwood Country Club as they closed their doors to make room for a new development project. The party included some of the best food we have had at a Club known for good food. As we move further into 2015 we are happy with returning to the location of our roots (Rizotto Ristorante was the site of Daffodils Restaurant where the Club was chartered in 1988) where we continue to enjoy great lunches, speakers and networking. Click on the Calendar link above, or click here, to see a list of coming Rotary Club of Amherst East speakers and programs.